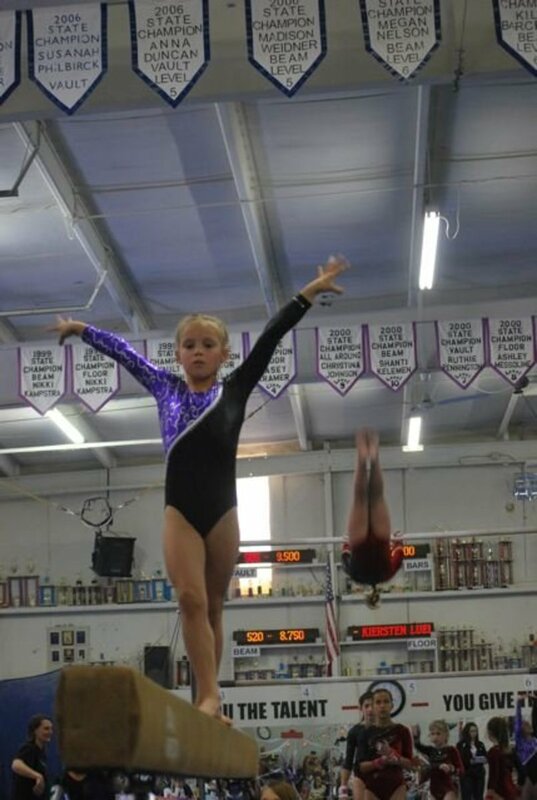 Do you have a daughter, grand-daughter, or niece that loves competitive gymnastics?My 7-year-old is already in her second year of competition and is enjoying showing off more advanced skills in girls gymnastics Level 5. 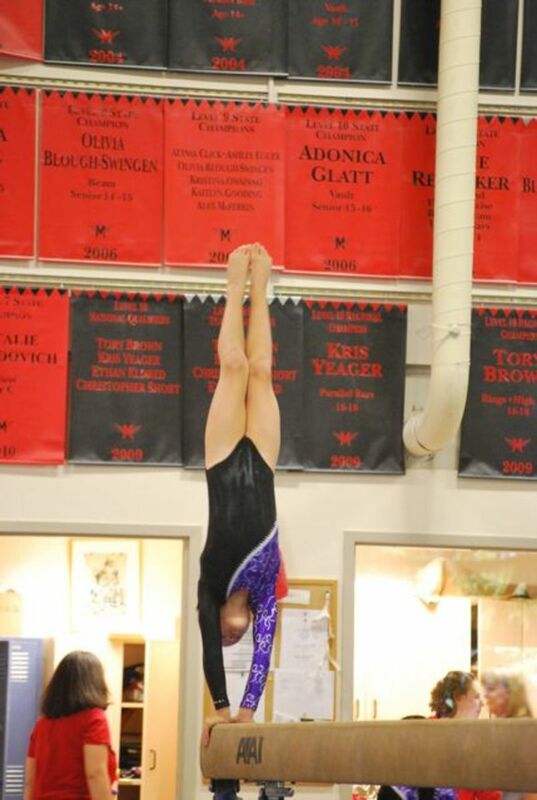 Personally, I just love attending her gymnastics meets, as well as her practices! Gymnastics is both a team and individual sport. 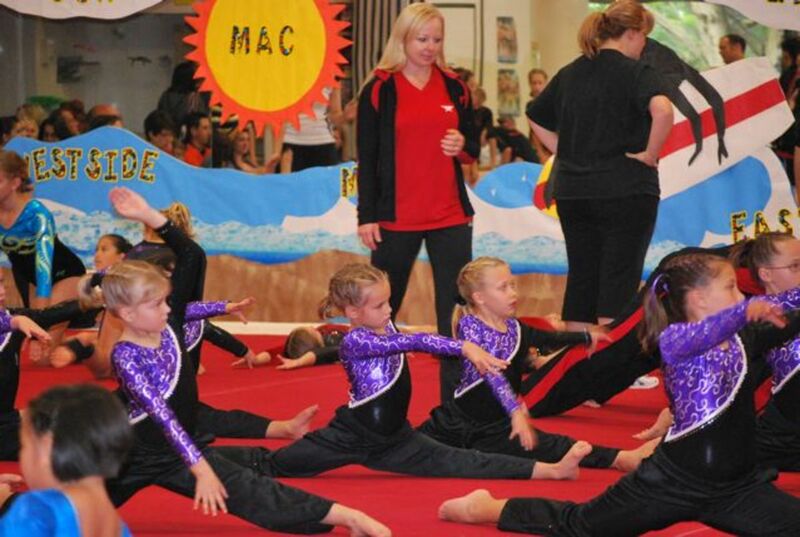 Girls perform routines and skills individually and obtain scores for their routines. They can win awards for each of four individual events (floor, vault, uneven bars and balance beam), as well as for their combined "all-around" scores. The all-around scores of the individuals on a gymnastics team are also added together to get a team score, which determines which teams at a gymnastics meet get first, second and third place. 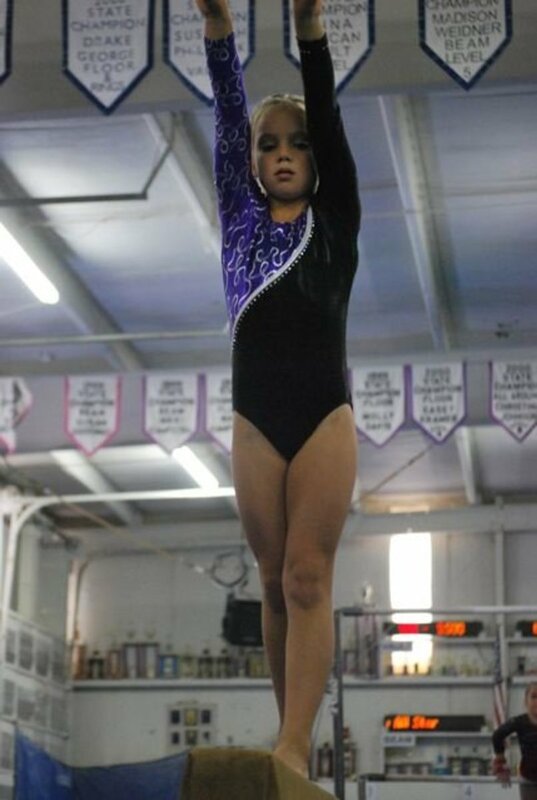 Girls gymnastics not only develops athleticism, but also poise, balance, core strength, and the ability to perform in front of an audience. For better or worse, these athletes also learn important life lessons about "fairness"—it's a subjective sport, so scores are not always consistent. But what is "Level 5 gymnastics" anyway? 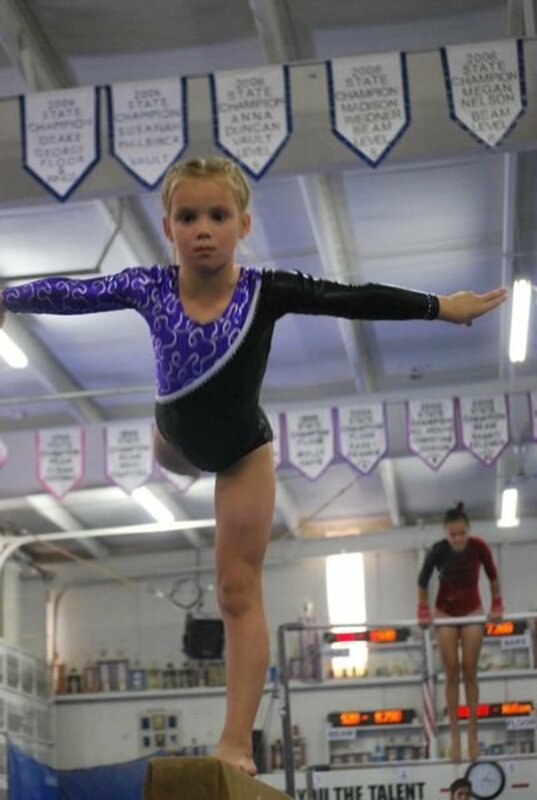 How old do you have to be to compete in gymnastics? 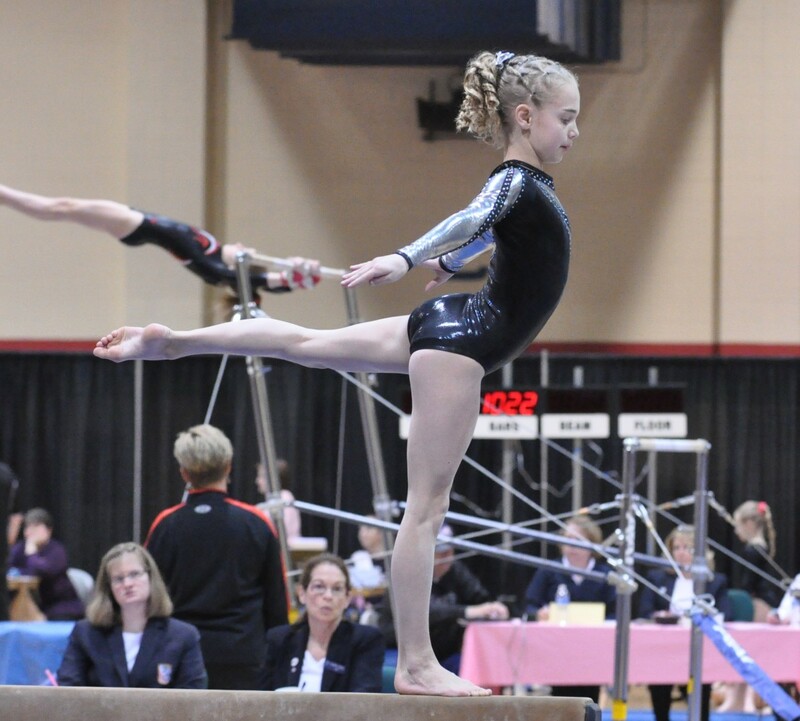 What are the requirements and what can you expect with a gymnastics program? Read on! 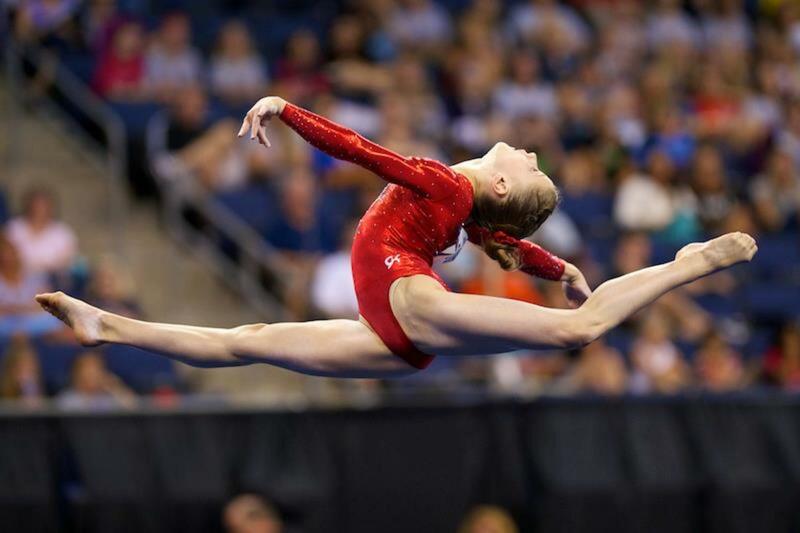 This article is a guide to the USA gymnastics (USAG) program. There are 11 levels in the USAG, but not all individual gyms will offer training and/or competition in each of the levels. 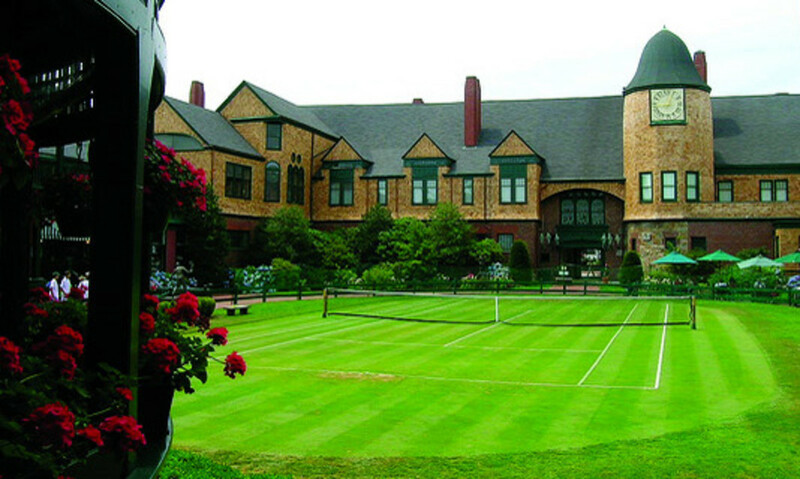 If you live in a large, metropolitan area, you can probably find a variety of approaches to fit your individual needs. 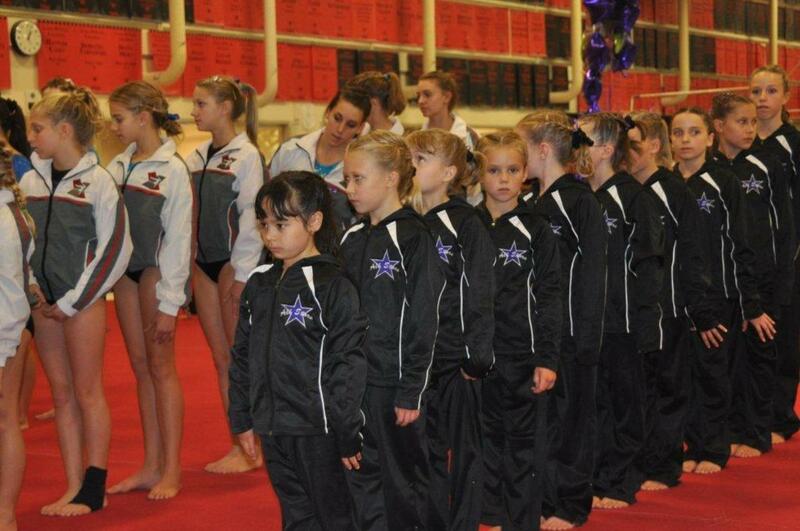 Girls learn routines and skills in levels 1-3, but will not compete in sanctioned USAG meets. 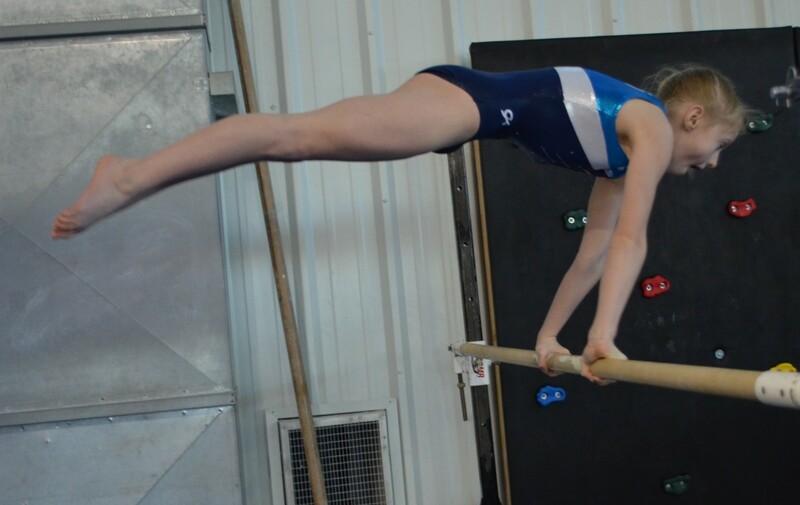 Gymnasts at these early levels will develop a familiarity with the four Olympic events in which girls compete: floor exercise, balance beam, uneven bars and vault. 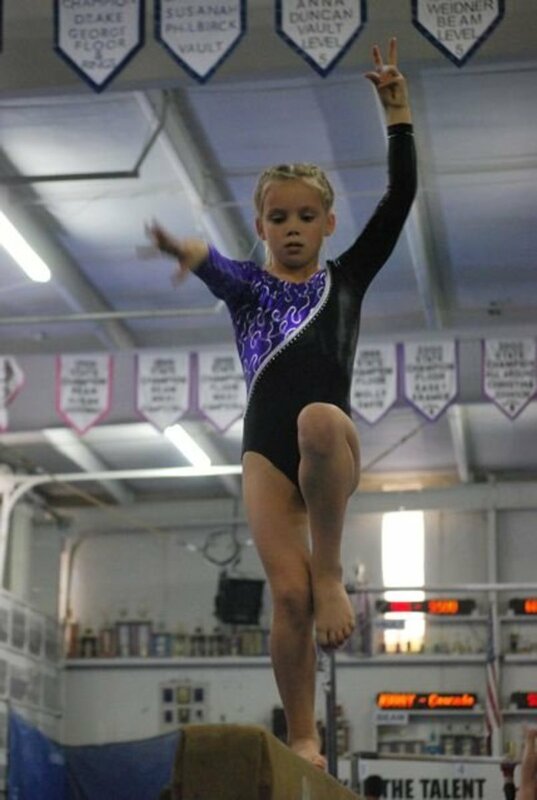 In gymnastics levels 4-6, all athletes learn and perform the same skills at gymnastics meets. The routines are called compulsory, in that the gymnasts are directly compared against each other as they execute a pre-choreographed series of skills; on the floor exercise the same music is used for each competitor. The minimum age for competition for level 4 is 6 years of age. For levels 5 and 6, you must be 7 years old to compete. From level 4 through 6, you will see similar skills, but they build on each other with respect to difficulty. As a gymnast moves through the compulsory gymnastics levels, the routines will look much the same, but - for example - level 4 requires a round-off back handspring, while level 5 requires a round-off back handspring series (2 back handsprings). Level 6 requires a round-off with 2 back handsprings and a back flip. Levels 7 and above are optional competitions. Gymnasts choreograph their own routines on each of the events. However, the skills performed on each of the four events must meet optional rules established by the Federation of International Gymnastics (FIG). Rules pertain to compositions, degree of difficulty and execution (which correlates to scoring). 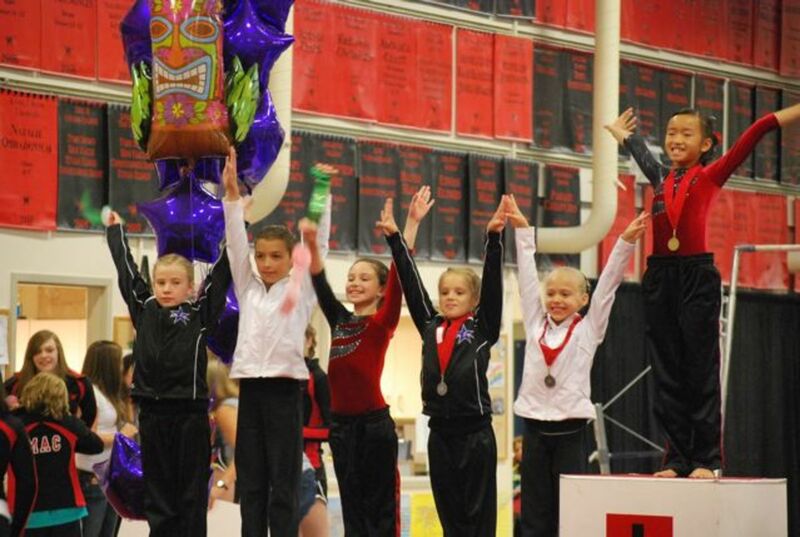 For level 7, the minimum age for competition is 7; for levels 8 and 9, the age is 8. 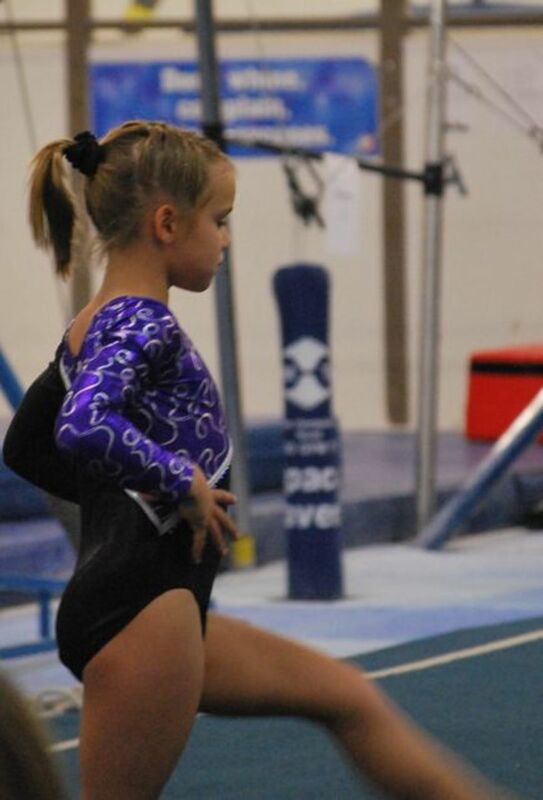 Level 10 gymnasts must be at least 9 years old. It is generally the highest level in many gyms and is considered to be a pre-elite level. 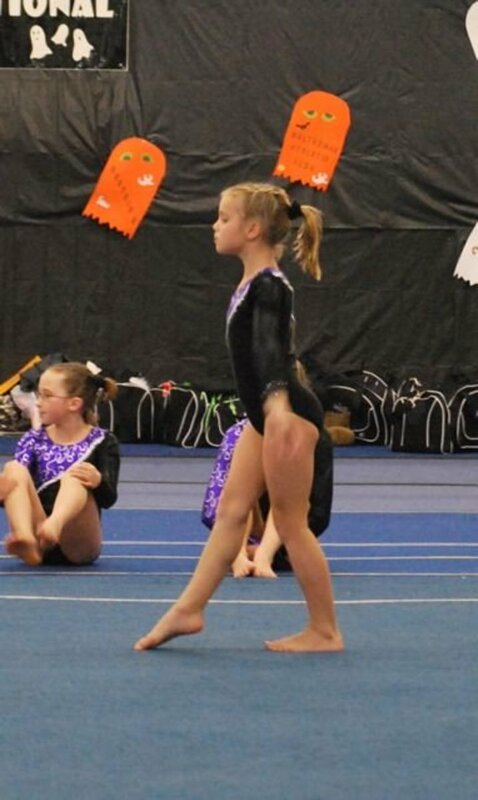 My daughter has one Level 10 gymnast at her gym, and two Level 9s. Beyond Level 10, there is Level 11, which consists national and international competitions. Child National Elite (10-12 years old) and Junior National Elite (13-15 years old) compete through skill testing and optional routines. Senior National Elite (16 + years) compete with optional routines only. For those amazing athletes at Junior International Elite (11-15 years old), they compete optional routines. Senior International Elite compete at the Olympics and World Championship if they are chosen for the teams. 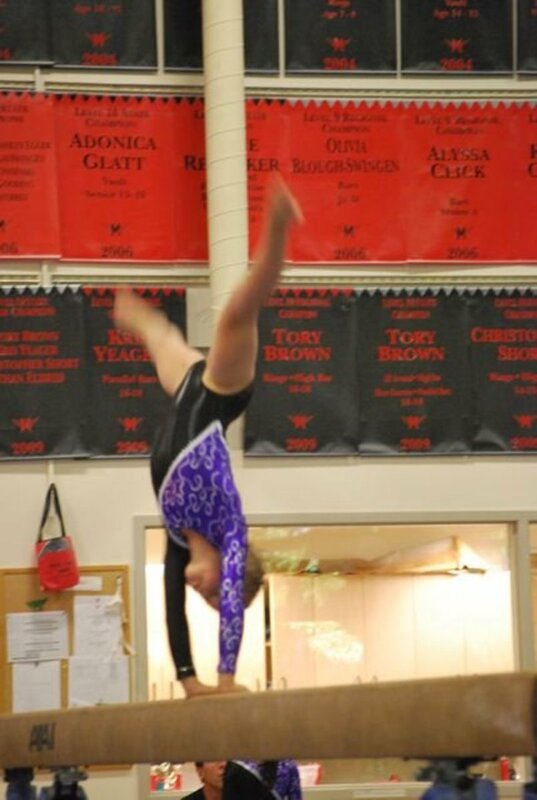 The level 5 vault in girls gymnastics is a front handspring. After being called by the judges, the athlete salutes, then runs down a run way, hurdles and jumps onto a springboard, up to a handstand from which they "pop" their shoulders and land onto the mat on the other side. Scores are awarded on a scale of 1-10. 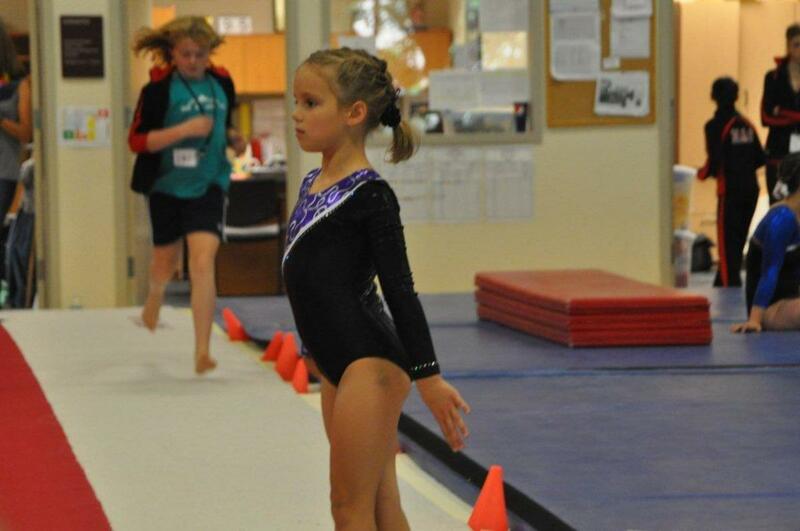 Every gymnast starts with a 10 and the judges take deductions from 10 to arrive at a final score. The USAG allows 2 vaults at each competition. The highest score of the two vaults performed counts (there is no averaging). 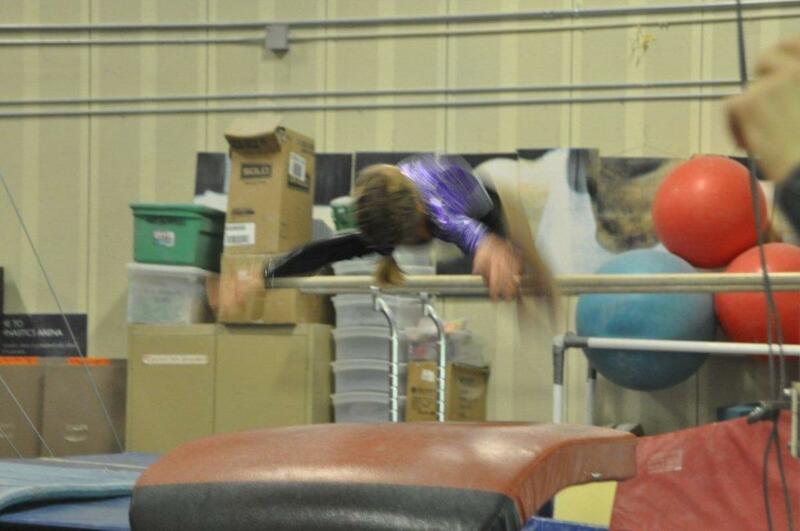 If a gymnast touches the springboard or the vault without going over, a score of zero will be given - for that vault. Points are deducted for poor form (including bent legs, legs apart, body rotated, toes not pointed, sluggish execution and failure to stick the landing). PREFLIGHT: From the spring board to the vault. The gymnast's arms must swing forward until the shoulders are extended and open. Head must remain neutral, while the body is tight and straight (no pike position). A close-to-vertical position is optimal. 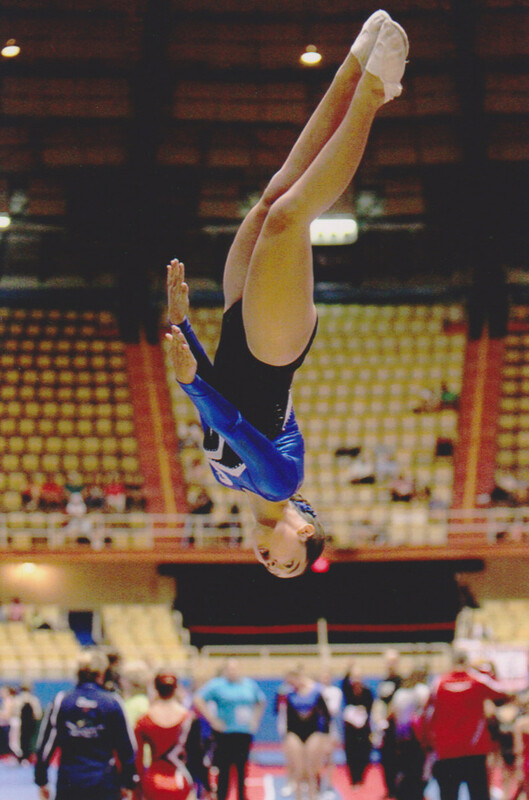 CONTACT: The gymnast must block (pop) their shoulders against the vault without bending arms. POSTFLIGHT: Much the same as pre-flight with tight, straight body position. Land and stick without stepping out. The USAG Level 5 uneven bars routine is a significant step up from Level 4. The routine requires gymnasts to execute two glide kips - one onto the low bar and other up to the high bar. It also requires a cast to squat-on on the low-bar, jump to high bar and both front and back hip circles. Once again, the gymnast starts with a total possible score of 10.0. Deductions are taken for elements that are not properly executed until a final score is reached at the end. Again, the gymnast waits her turn until called by the judges. She will salute the judges and then begin the routine. At the conclusion, she will salute again, and then leave the mat. CAST: Immediately following the front hip circle, the athlete must cast from the bar and reach a horizontal height (straight from shoulders to feet). Tight body and straight arms are a must. DISMOUNT: After reaching at least 45 degree angle below the high bar, half turn and re-grasp the high bar then drop to the mat and stick landing. 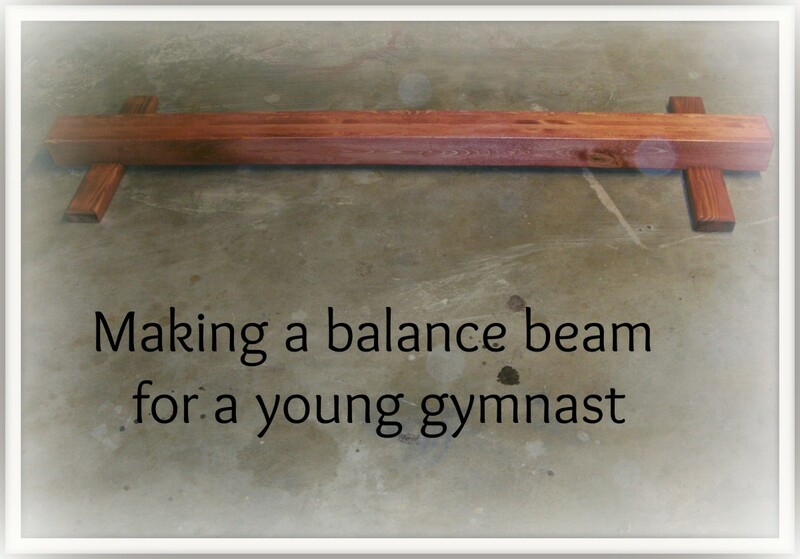 The balance beam is an especially challenging apparatus in girls gymnastics. Just 4 inches wide and standing 4 feet above the ground, athletes tumble, pose, turn and leap on the beam. The mount and dismount also count towards the final score. A flawlessly executed beam routine will be smooth - no wobbles, and no falls. 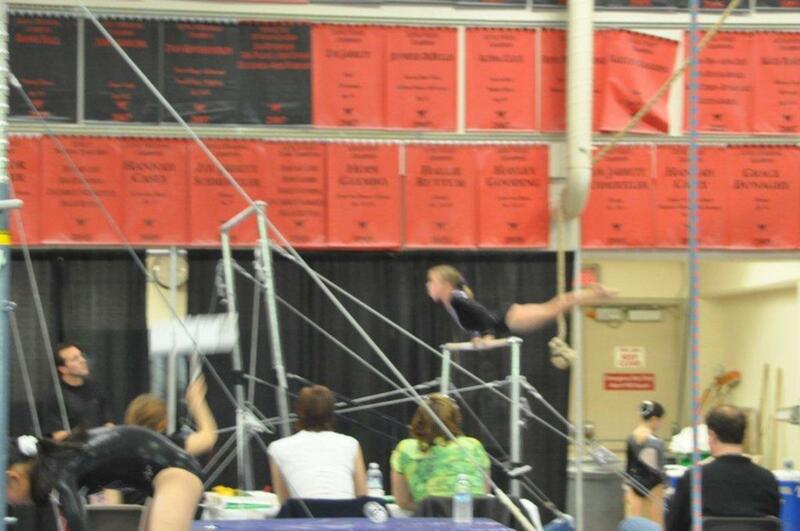 If a girl falls off the beam, its an automatic .5 deduction from her score. More than one fall can quickly lower an overall score. 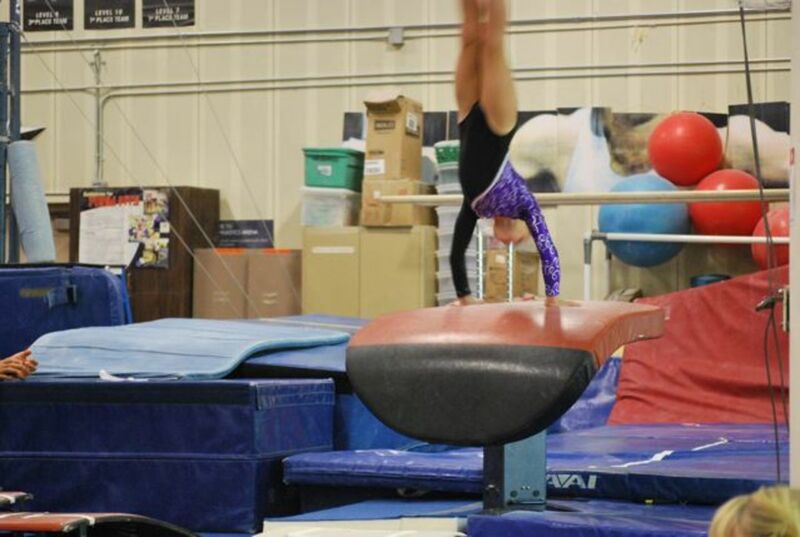 MOUNT: Swing your leg up and over the beam, to end in a cross straddle sit. Pull your legs up in a V-sit and then stand up without touching the beam. Keep all the movements fluid and strong. 1/2 TURN: In a coupé position, smoothly turn, using your arms, to face the opposite direction on the beam. LEAP: To get the best score, legs should reach at least 90 degrees separation. Keep legs straight and toes pointed. Land and hold a low arabesque. HANDSTAND: Hinge into and out of the handstand while stretching out body. Close the legs together at the top. Reach vertical position and hold for one second. TWO PIVOT TURNS: In a releve position, turn once each direction. CARTWHEEL: Slowly and deliberately executed, keep body tight, legs straight and toes pointed. JUMPS: A pair of jumps, connected together - straight jump, then split jump. ARABESQUE and SCALE– Back leg lifted at least 45 degrees and hold for 1 second, go into a scale, lifting the back leg up to at least 90 degrees and hold for 2 seconds. DISMOUNT- Cartwheel to side handstand and hold for 2 seconds, then turn 1/4 to dismount, parallel to balance beam. Land and stick. What gymnast, or spectator, doesn't love the floor routine? 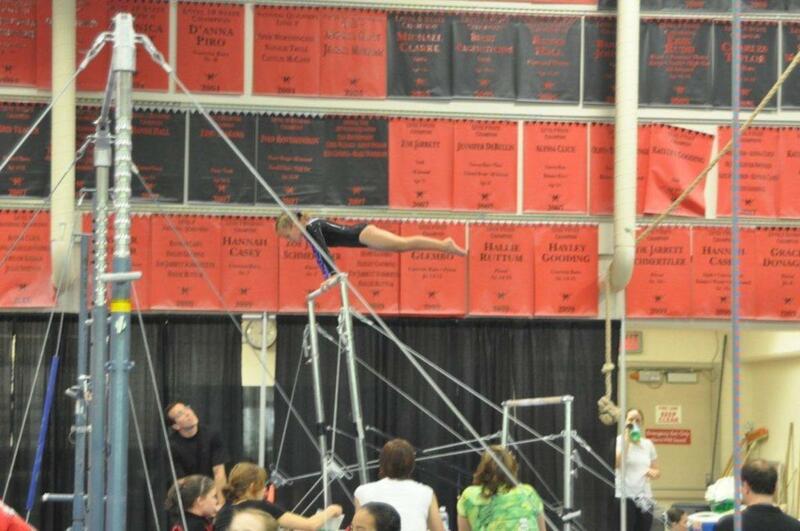 For girls gymnastics, this apparatus is the only one for which music is played. Compulsory routines use the same music for all athletes. But, skills are a combination of ballet, strength and tumbling. The Level 5 floor routine is the first compulsory level in which more advanced tumbling skills are showcased. Just remember that graceful moves will help garner the highest scores! BEGINNING: Start in first position (ballet) with feet. Stretch arms up side and down. Two bounces and then straddle jump. PUNCH, DIVE ROLL: Anticipating Level 6 routine's punch front flip, in the level 5 floor routine, the gymnast does a punch (jump with both feet) then dive roll to smooth stand and finish. DANCE: Side chassé with a 1/4 turn, hop, pose and then stand. DANCE: Leap, step swing, hop 1/4 turn. Slide to floor, turn, kneel and then slide into front splits. Prance with weight transfer, then 1/2 turn. BACK EXTENSION ROLL: Backward roll to handstand. Keep arms straight and legs tight. Step out, and finish. DANCE: Step, kick, pose - full turn. Hitchkick, swing turn. BACK WALKOVER: Start with leg lifted, arch back, keep legs straight and toes pointed. DISMOUNT: Run and back-handspring series (2 back handsprings). Pose. 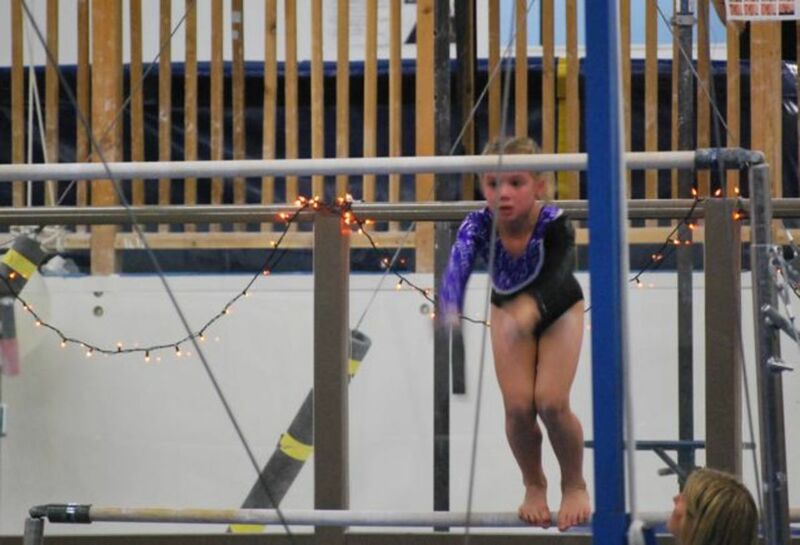 Gymnastics meets can be nerve-wracking, especially for younger girls. For this reason, you'll want to make sure to be a courteous member of the audience. Be respectful of other spectators; do not block them while taking photographs or videos. Keep talking to a minimum and silence cell phones. Impressive hub... Anything on how to improve your scores? This was so helpful...I have a granddaughter that is a Level 5...I loved watching her compete...this is very helpful...I am actually going to pull it up and read it with her...Thank you..Yes it is a sport that you have to love and be committed to. I have been a gymnastics coach for over 20 years, and it's nice to hear a parent that understand our sport. Most parents and gymnasts will tell you that competitive gymnastics is one of the biggest commitments in their lives next to family and church. Tough sport but so many lifeskills are learned. Great hub. Very nice hub.i love every bit of it. Great hub! Our level 5 boy is trying to come back from a shoulder injury. It does take lots of dedication! Lots of time in the gym. He was training about 14 hours per week, before his injury on the rings. His 1st two meets this year were great, but it looks like his meet season is over. Our daughter is hoping to be chosen to compete as a level 4 next year. My daughter really wants to do gymnastics, I just can't afford her to get an accident. Hi Lamme - yes, it is very time consuming. My daughter trains "only" 12 hours a week at the gym, and then there are meets to which we have to travel. She is loving it so much, but we are carefully watching to make sure she doesn't get overwhelmed. Lots of work on moms' part too - you are right! Very interesting. I love the whole thing. 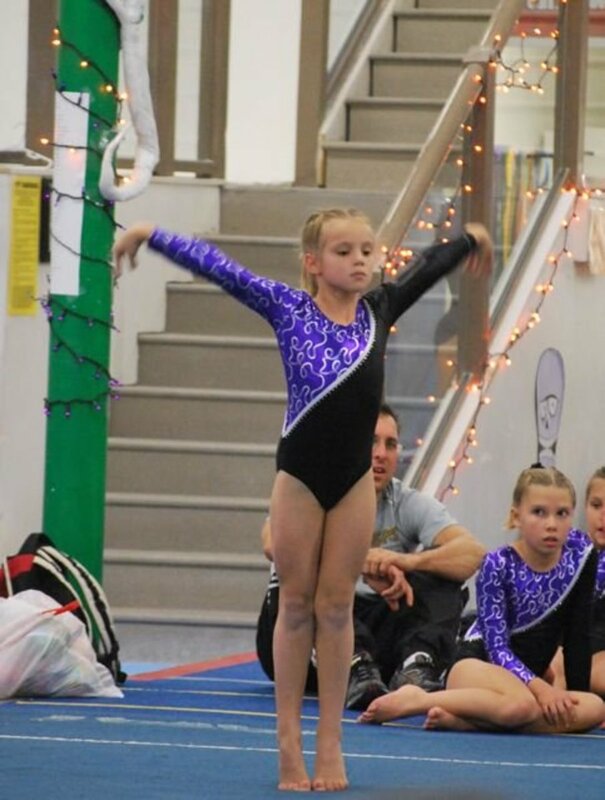 My daughter competes level 5 gymnastics. At this level it starts getting serious, but still fun. She loves it. Nice hub, very thorough. Very impressive! Your daughter is lovely and talented! I live the spirit of sport here. Gymnastic also the healthiest sport. Thanks for share with us. Very useful. I really enjoy all the pictures. Good work, my friend. Rating up. Wow, looks like your daughter is already a winner. 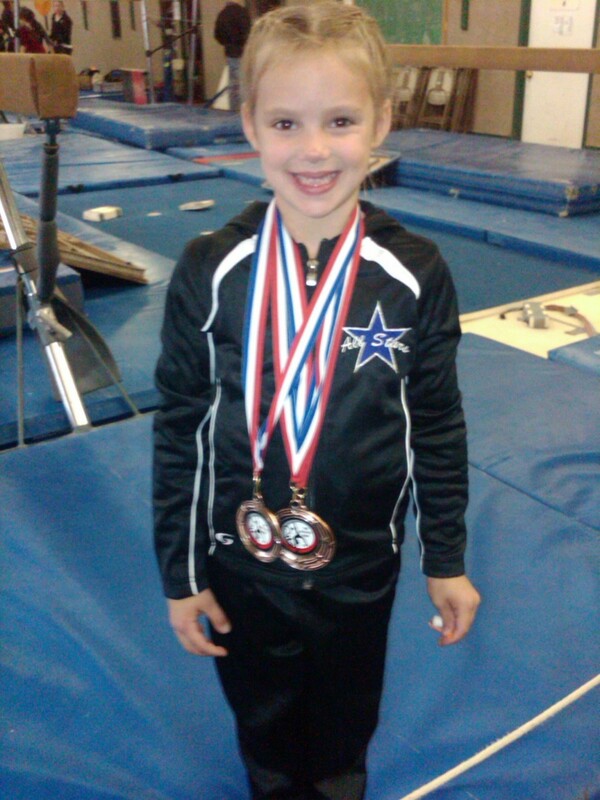 Competitive gymnastics takes lots of discipline and your daughter definitely has it going. Yes, it is a systematic training program for gymnasts here in the US (and I expect in other countries, as well). I'm really enjoying it through the experience of my daughter. As pakpub mentioned, the higher the gymnasts go in the levels, the more time commitment it takes, too! Wow, US really provides a systematic training for gymnast. And your daughter is awesome ! Excellent hub for us, the outsiders, to know the overview of the programs. The dedication and discipline that this sport requires should really pay off into adulthood! I can tell you're extremely proud! An extremely athletic child; keep the support there. I bet her future goal is the Olympic Championship. My daughter made it up to level 8. She was practicing 20 hours a week then. I love the sport and loved to watch her compete. Nice hub! Wow that looks like a tough sport. Adorable child, too. My granddaughter is trying a lot of new things, she is ice skating now, but this looks like something she might enjoy.